I love not only the quaint architectural details in this photo, but also the MOOD. The quiet light of dusk provides such a peaceful palette of grays, blues, and pinks. We hope you enjoyed our mini series of Guest Photographer Color Palettes ~ huge thanks to everyone for participating! Stay tuned for our collaboration with Anna early this year! Each week for the next four weeks, we'll be featuring a color palette based on the work of a special guest photographer. Today's pastel palette is brought to you by The Wagyu Story, a husband-and-wife team based out of Singapore and Bandung. The word “Wagyu” in the company name does not refer to top-grade beef, but is actually an acronym for “What A Goofy Youthful Unison”, which is reflected in our personalities – Tata & En-En, who fall madly in love not just with photography, but also with one another. It is also because of our love of food that we choose the name. So cute! I officially want to be your friend, Wagyu! 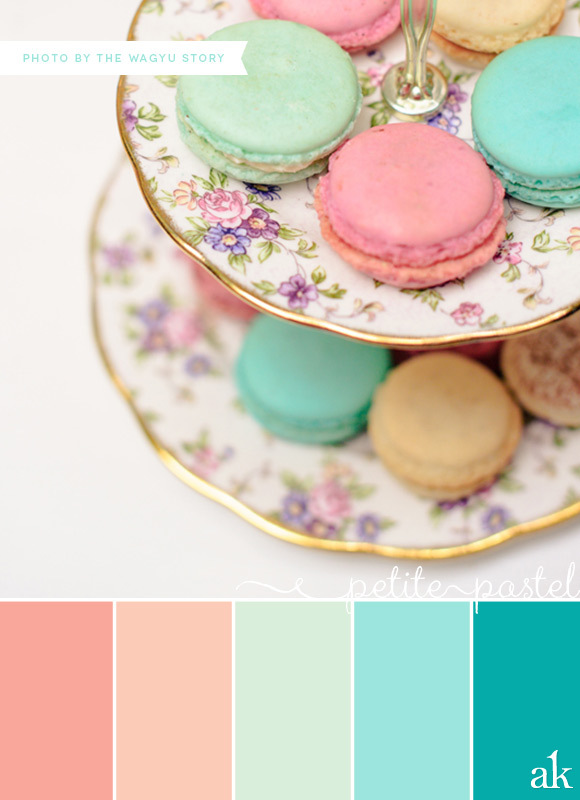 Aaaand, speaking of cute...how about these picture-perfect pastel macarons? I love the sweet and delicate combination of coral, peach, mint, and aqua. Mmm! To see more beautiful photos by The Wagyu Story, please visit their website or Facebook Page. Thank you, Wagyu ~ we look forward to following your adventures in 2014! This summer, we watched a pair of doves raise their babies in the tiny tree out back. As weeks passed, we couldn't help but marvel at their dedication: if they weren't sweating it out in 105-degree heat, they were getting pelted by giant drops of rain. Then...finally...we saw two brown chicks appear. They grew quickly, and before we knew it the nest looked severely overcrowded. I started watching the nest every morning, trying to get a glimpse of a first flight, but no luck. Then I looked out the window one rainy day to find an empty nest and Mom or Dad waiting on the fence. (That's when I took the picture up top.) At first, I thought the babies were on a temporary excursion, but by nightfall the adult finally left and that was that. Watching the process from start to finish was so fun...it's amazing to see animals raise their young. The pink, purple, and green pastels are a great foundation for a cool, refreshing color palette!